MTP? That’s military acronym for Multi-Terrain Pattern camouflage. Designed to be worn under body armor for releasing heat and greater comfort. 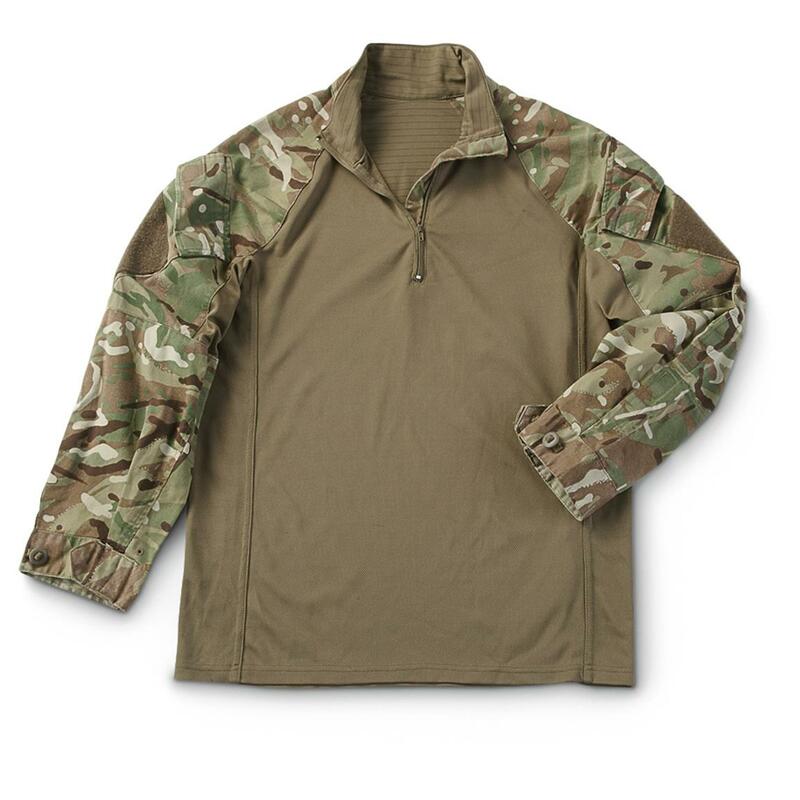 British Military Surplus MTP Camo Combat Shirt, New is rated 4.5 out of 5 by 8. Rated 5 out of 5 by Lubbock from Excellent shirt Well, I should have purchased numerous ones when I had the opportunity. I am 5'-10" tall and about 200 lbs. Size L fit me perfect. The sleeves are oversized (circumference, not length), so they are a bit baggy. There are numerous foam pads that you can take out of the sleeves. If you use them where you will be banging your elbows/arms on things, then leave them in. Comes with a British flag on the sleeve and Velcro insignia patches. I took both of these off for a generic look. Neck zipper works flawlessly. Very nice autumn attire for hunting, casual, etc. Rated 5 out of 5 by Thomas from Great shirt The shirt fits and came with padded shoulders slevees. The fit is good and it works as intended. Rated 5 out of 5 by TomS from Great Price Great Fit Great Price. Great fit. Matches the MultiCam pattern nicely. Looking forward to wearing for turkey hunting in the next few weeks. Rated 3 out of 5 by Saint from British Combat Shirt This is not quite up to par with the Crye or even the Propper combat shirts, IMHO. The one thing that surprised me was the fact there are 3 separate paddings in each arm; forearm, elbow/bicep, and shoulder. They can be washed with the shirt but I took mine out, and it took me a good while to put them back in. Aside from that, the arms are so big I could fit both arms in one sleeve. If you need extra padding, this is a decent shirt. Rated 4 out of 5 by limey72 from Great addition to my GB camo Fits great, looks like it will fit under my DPM jacket ok. Another great addition to my GB camo collection.